Bristol's hopes of a super-stadium home for the city's two football teams and the rugby club have been dealt a major blow. A joint statement issued by Bristol City Council, Bristol City and Bristol Rovers, and Bristol Shoguns rugby club revealed plans for the 40,000 capacity stadium had been shelved indefinitely. The news spells the end of two years work to try and find a site for the planned Wembley of the West. Although all parties stress the plan is not dead, the abandonment of the scheme will make it difficult to resurrect. The joint statement said: "We have considered several sites in Bristol and have employed specialist consultants to analyse whether any of them were suitable locations. "Having considered their assessment, the clubs and the council have all agreed that it will not be possible to build a new stadium in the city within an acceptable time frame. "Although the prospect of a new stadium has had to be shelved, the clubs and the council have agreed that if circumstances change they would be willing to get back together to achieve this goal for Bristol. "The clubs now need to progress plans for improvements at their existing stadiums." Leader of the city council, Diane Bunyan said: "Bristol's professional clubs are rooted in the community. "I'd love there to be a new stadium to serve Bristol but everyone is agreed that is doesn't stack up at this time and it's best to be open and honest about that." 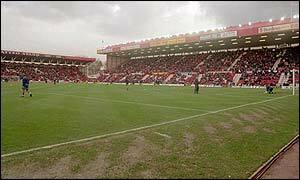 Bristol City's Ashton Gate ground is the city's best stadium, but it has a limited capacity of 21,500 seats. Bristol Rovers have led a nomadic existence since the closure of their old Eastville home in the 1970s. After a spell at Bath's Twerton Park, they now share the Memorial Ground with the Shoguns rugby club. The Memorial Ground holds just 12,500.